It's a common fact for the golf world at this point that Tiger Woods doesn't lose when he is in control. In fact, he has never lost a major championship when leading the tournament after 54 holes. 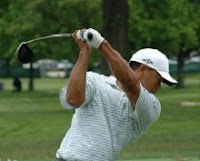 This was the scenario at the 2008 U.S. Open: Tiger Woods one stroke ahead of the nearest competitor. However, the Tiger of this U.S. Open is, ultimately, weaker than usual. Coming off of an extended break due to surgery, fans saw Woods noticeably coping with his industry. By the 72 hole for Woods, playing in the final group, it looked like his run might be over. Rocco Mediate, a Pittsburgh, Pennsylvania native, sat in the clubhouse with a solid one strong lead over Tiger. Thus, as Mediate watched the broadcast, he knew only one thing could deprive him of his first major championship: Tiger's usual. Woods stood on the 18th green in two, 12 feet from the cup. Naturally, the world's greatest player sunk the putt to send the U.S. Open to a Monday playoff. Tomorrow, Mediate and Woods will engage in an 18 hole head-on-head battle for the major championship. Both players finished the week at one under par; the first time the leader(s) has finished under par after 72 holes at the U.S. Open since 2001. 0 Response to "Tiger converts putt on 18th to force a playoff at the U.S. Open"